Confessions of a Litwit: Which Jane Austen Heroine Are You? 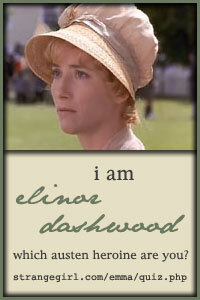 "You are Elinor Dashwood of Sense & Sensibility! You are practical, circumspect, and discreet. Though you are tremendously sensible and allow your head to rule, you have a deep, emotional side that few people often see."